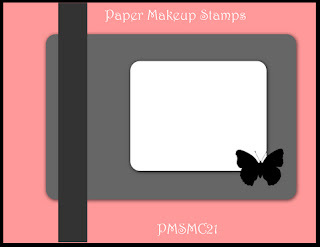 Paper Makeup Stamps has another freebie for you, and it's only available for one week! It's another digi wordart which you can get at the PMS blog. I've made a card to showcase this particular one. I've printed mine out large so it would be the focus of my card (and I followed the SCS sketch from this week, too). 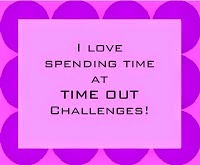 However you could print it out smaller to go along with an image or place it on a scrapbook page. There are so many possibilities. And the price is right...FREE!! So hop over to the PMS blog and get yours today! When you make your card, make sure you post it on the PMS blog or use Paper Makeup Stamps as you key word if you post to SCS/PCP! Also don't forget about sneak peek week at PMS. The sneaks begin Monday and continue throughout the week. The release par ty is on Friday. You can see the details on the top of my sidebar. We hope to see you back for the sneaks and the party. Enjoy your weekend! ETA: I just saw that my friend, Cheryl Rowley, is giving away some awesome blog candy for reaching 50,000 hits on her blog! She is an awesome artist and your jaw will drop when you see her copic coloring! Here's the direct post to the blog candy giveaway, but look at her entire blog starting here, too, and leave her some love...it may get you some great candy! I was surprised the other day to be asked to be on another design team! 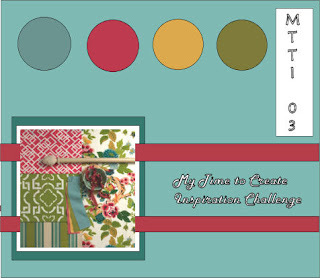 Kristin from Artful INKables invited me to join her new design team for the next six months beginning August 1st! I was very excited to have been asked and I'm looking forward to this challenge! I am officially an "INK Girl"! Here are the other new members on the team. Also I'm happy to announce that two of the current members have been asked to stay on as Senior Design Team members, and they are Joy Stagg and Holly McMillen. It seems Holly and I have come full circle! She is currently living in Colorado, but lived about two miles from me previously. She and I met at Starbucks about a year and a half ago to get to know each other and that day I started blogging, thanks to Holly! So I'm so excited to be working with her on this team! I can't wait to share Kristin's designs with you! Let the fun begin! Do you like cherry pie? I'm not much of a pie eater, but I do like berry pies and pumpkin pie at Thanksgiving! Mmmmmm, I'm hungry now! 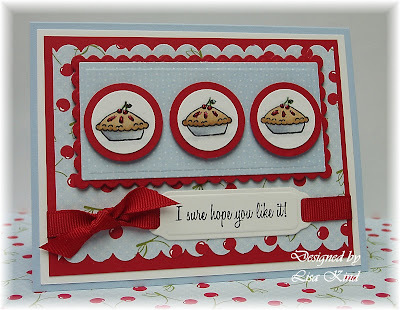 Well, I have a cherry pie card for you today using the new release called Cowgirl Up! by Anna Wight for Whipper Snapper. Here's the set. What I like about this is all the smaller stamps you can use. This is a western-themed stamp set, but look at the fancy drink glass, the beer mug, the flowers, and that cherry pie! So many options! So here's what I did with the cherry pie. Not very western is it? I used SU's retired Summer Picnic dp for my cherry pie theme and colored my pies with copic markers. I added red stickles to the cherries and slits in the pie and green stickles to the leaves. I just love this card! I made another card with this set which you can see in this post. I also used the Taylored Expressions sketch for this card. You should stop by the Whipper Snapper Featured Designer gallery on SCS here to see all the great things the other Featured Designers are doing! Fabulous stuff! Thanks for stopping in today! Hi all! Are you ready for some more Halloween Fun? 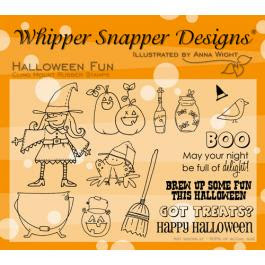 I'm getting ready for it with this new set by Anna Wight for Whipper Snapper. Here's a look at the set. It's a great set with all sorts of cute images that make it very versatile. 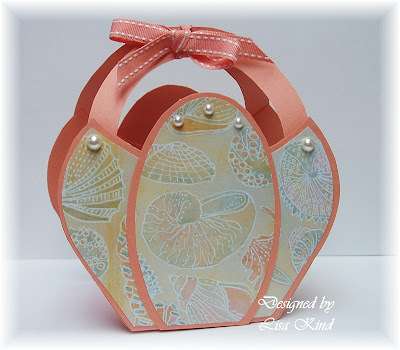 You can see what I did with a few of the images and chipboard in this post. Here's another one I've done today using this set. Pretty colorful, huh? That's what I like about Halloween...all the fun and bright colors! I started with this new Halloween dp from K & Co. 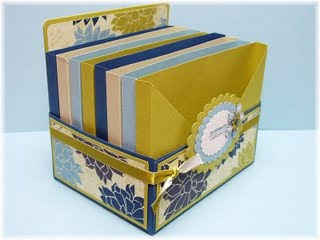 It comes in a smaller 12 x 12 stack, but the papers are FABULOUS!! (I hate when papers are double-sided because it seems a shame to "waste" the other side!) I was enabled by my friend Cheryl Rowley to purchase this pack and a few other things from JoAnn's! (My credit card was smokin', let me tell you!) 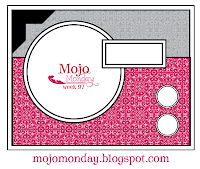 I used the Mojo Monday sketch from this week and cut out the candy corn for the embellishments on the bottom. The orange dots on the photo corner are candy dots, in keeping with the "Got Treats" theme of Halloween! 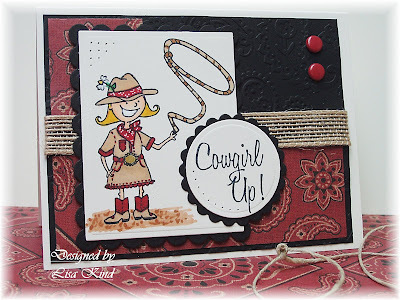 Tomorrow I'm going to have another card from the other new set Anna has out called Cowgirl Up! that doesn't have a cowgirl theme to it. So come back tomorrow and see what I have for your viewing pleasure! Thanks for stopping in today! Hi everyone! I hope you had a great weekend! It pretty much rained all weekend here...it's been a rainy summer! 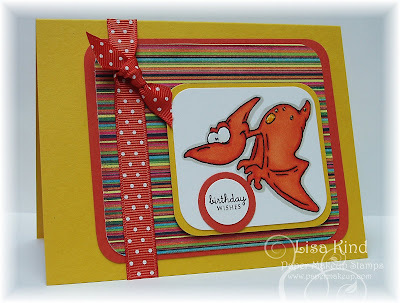 But I have a pretty bright card to show you for our Paper Makeup Stamps Monday challenge. 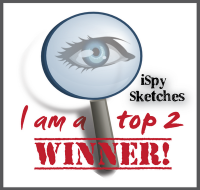 Kim Stewart issued a great sketch challenge for us. Here's the sketch. I thought that the Dustin Pike dinos over at Paper Makeup Stamps were being a little neglected lately (we all love the fairies and wordart...LOL!! ), so I decided to use Terry the Pterodactyl. Terry is colored with copic markers to match this Lime Rickey dp by Basic Grey. I also used the new SU in-colors Crushed Curry and Dusty Durango. The polka dot ribbon is also SU's new Dusty Durango. I added some yellow stickles to his freckles and crystal effects to his eyes. I changed the placement of the sentiment a little because of the way Terry was facing, but I guess that's allowed, right? It sort of looks like he's carrying the sentiment! 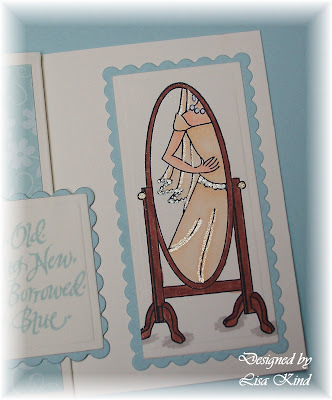 You can see all the cards the DT made on their blogs (you can access them on my sidebar) or you can visit the PMS blog to see what they have for you. If you decide to play, post your direct link on the PMS blog, and if you post to SCS/PCP, please use the code PMSMC21. Now I have another to share with you. 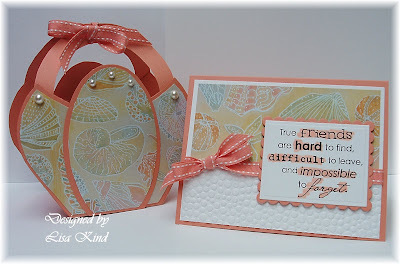 This was for yesterday's Featured Stamper challenge on SCS. Versamom was the FS and she has a great gallery. 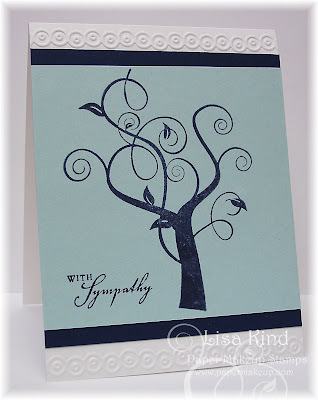 I chose to case this card because of it's simplicity and because it reminded me of this PMS Swirly Tree stamp that I've never used. This is what I came up with. I kept the same layout and added the embossing on the top and bottom. I used Soft Sky and Night of Navy as my colors. The sentiment is from PTI's Out on a Limb. This was a fun and easy card to do! Thanks for stopping in today and have a great week! Well, it seems this is My Timeless Template weekend for me! My post from yesterday included two template projects and I have another today! 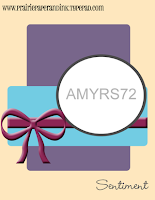 I went to a 40th birthday party on Friday for my friend, Melissa, and her gift was a gift card. I wanted to place it something pretty that she would appreciate (she's a crafter too!). The new Pretty Petal Pocket was too pretty to pass up, so I opted for that one. Here's my gift combo for Melissa. This gift and card came out so pretty, IMHO! I started with this great dp that was given to me by my friend, Cheryl Rowley. I paired it with SU's retired groovy guava. I still had some ribbon to match, so I was good to go. Of course I had to have a card to go with it (believe me when I say this was an afterthought! ), so I used the same papers to come up with this. I didn't have time to color an image and get fancy, so I used one of Paper Makeup Stamps new word art digital images for my focal image. Great quote for a friend, don't you think? I printed out this digi image (it costs all of a $1.50!) and highlighted some words with a copic marker. I embossed the bottom part of the white mat with a cuttlebug folder. (I just saw Gina K do this on one of her Stamp TV episodes. While I've done this before, this episode just popped into my head and gave me the idea to do it again!) I placed another piece of the dp on top and finished it off with ribbon. The sentiment was placed on dimensionals. So quick and easy! Melissa loved her gift and so did I! It was difficult to let this one leave my crafty little hands! LOL! Oh, one more thing! 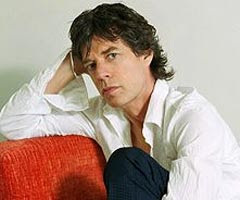 I just have to mention that today is the birthday of one of my favorite people....Mick Jagger! He's 66 years old today! Yikes! I've been a fan since I was 5! Can't help it and I'm not going to explain it! I love Mick! LOL!! Thanks for stopping in today. Enjoy your Sunday! It's Saturday, so it's another My Time to Create Challenge. Today we have template challenge for you. This is the inspiration Lauren gave us for the template challenge. 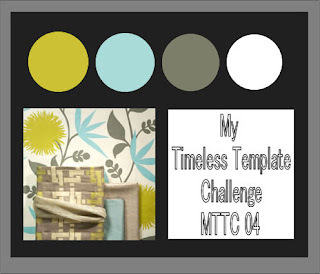 You can use any of the My Timeless Templates for this challenge. Here's a peek at what some of the My Time DT has done. Now here's what I did. I used one of Lauren's newest templates called Milk Made. This template comes in two different sizes, and I used the smaller of the two for this project. So I have to admit, I love the template, but I'm not thrilled with my end result. I'm going to show you another I did a while back with these same colors that I like much better. Here I used SU's basic gray, baja breeze, and Urban Garden retired dp. I added kiwi kiss satin ribbon, some prima flowers, and a button. I didn't do any stamping on this. If it didn't take me so long to figure out what I was going to do, it would only have taken me about 30 minutes to pull this together! I did another one today (that I'll share in tomorrow's post) that I did right before I went to a 40th birthday party. So simple and quick to create! I'm going to a party today at our friends' house, and I think I'll add some Kisses inside this one and give it to them as a hostess gift. I have to say that the petite size of this is so cute! Now here is one I did in February that I just loved. I followed a video that Lauren did to create it. You can read the original post here, but I'll show the pictures again here. When Lauren created her project, I just drooled all over it! And when she made the video to show how to do this, I just had to do one too! 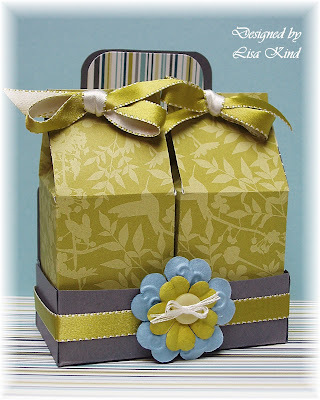 This one uses All Boxed Up and it was really an easy project. 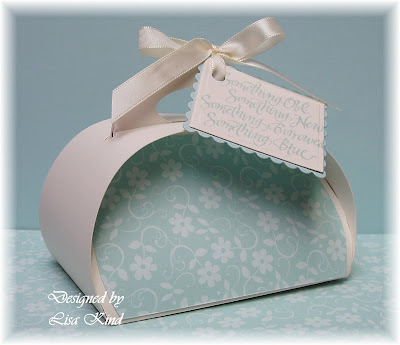 I used kiwi kiss, night of navy, baja breeze and sahara sand for my box colors and the base, and the Urban Garden dp and kiwi kiss satin ribbon. So you can really see how versatile these templates are. Wait until you see the one I'm posting tomorrow...I'm really in love with that one. Do you think you'll play along with our challenge this week? 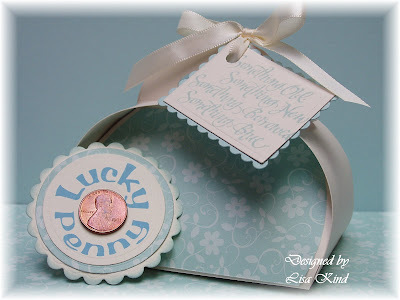 Pam is hosting today, so if you play, please link your project to Mr. Linky on her blog. If you post to SCS/PCP, please use the key word MTTC04 so we can find it! Thanks for stopping in today, and please stop by tomorrow for more! Have a great weekend! Do you like freebies? Who doesn't? Well Paper Makeup Stamps is starting a promotion called "Freebie Friday". Each Friday, a free download will be available, but it will only be available for one week. Then it will be taken down and another will be offered. These freebies will then be available in the following month's release, either in digi format or in rubber. This week, there is a very sweet word art that you will not want to pass up! Click here to take you to the freebie, and have fun with it! If you use it, post a link on the PMS blog so we can see it. 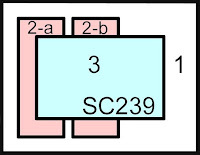 If you post to SCS/PCP, use the key words Paper Makeup Stamps so we can find it! Can't wait to see what you do with it! Super Thursday Sale at PMS! Hi everyone! I just thought I'd let you know that Paper Makeup Stamps is having a ONE DAY ONLY sale TODAY, July 23! Here's the link to the sale items. Check out all the other stuff while you are there too! Have a great day! ETA: I can't believe what I did! The color challenge I did today was from 12 WEEKS AGO!!! I thought it was today's! LOL!! What a loser! Well, I hope you enjoy my post anyway! When I saw the color challenge on SCS today, I knew I had to play. The colors are old olive, real red, and black! Love these rich colors! So I went to my Paper Makeup Stamps, and decided that this Smitten Snake (which has never seen ink...ack!) would be perfect for the green and his little tail is making a heart (red!)...perfect! Here's what I came up with. Cute, huh? I decided I needed a big red heart, cut with my nestie, and then I gave it some texture by running it though the cuttlebug folder (not sure of the name of it right now) that looked sort of "scaley" to me! The sentiment (and another one) actually comes with this snake in a set. I cut it out, rounded the edges, and then sponged some real red ink around it. I originally had started to put red buttons in the corner, then remembered these red crystal hearts I had from a Valentine's project and liked them much better! The dp is from Basic Grey's Lemonade. I like the olive and the yellowish green in it...it really pops off the red and black. So what do you think? I really like this! I now have a card to give to dh for Valentine's Day next year! (Do you think I'll remember I have it? Not!! LOL!!) Maybe I'll give it to him today. He has a project to do for my mom who keeps changing her mind and it's driving him (and me) crazy! Moms!! Gotta love 'em! LOL! Thanks for stopping by today! Have a great one! ETA: I have another post today, so please keep reading after this one! Ok, I've been sitting patiently on this exciting news since last month, and today I get to share this news with you! I was asked by Anna Wight and Whipper Snapper to be a guest designer for Anna's new releases in July and August! 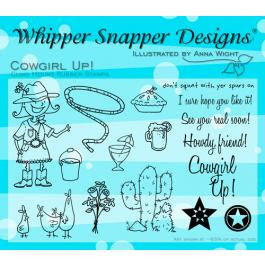 I was very honored to have been asked because I love Whipper Snapper designs (I own quite a few of their fun stamps) and because I LOVE Anna's creativity. She is not only a stamp designer, she's also a photographer who happens to live on a farm with all sorts of animals! Her photographs of these animals are fascinating and I enjoy them almost as much as her creations! Seriously, check out her blog. Anyway, Anna has two great stamp sets being released today, which you can see here. The first I'm going to share with you is called Cowgirl Up! It's really a fun and versatile set, as the girl can hold a variety of items in her hand. I chose to have her holding the lasso in my card. I love this little cowgirl! Anna pointed out her knobby knees on her blog...aren't they hilarious? I started this card with my dp, as I always do. I came across this in my stash the other day (from K & Co. called Bandana) and had forgotten I had it! I thought it would be a perfect compliment to this cowgirl theme. I used the color of the rope and the red in the paper to color my image. (Tip: I couldn't find the right red, so I chose one that was close and laid down some W-3 & 5 first, then layered the red over it. It made it a more smokey red color.) Her teeth and the petals of the daisy were colored with a white gel pen. I also used the white pen to add some dots to her bandana and on her hat. I don't know if you can tell, but the black mat was run through the paisley cuttlebug folder. I added some piercing, red brads and the jute ribbon. 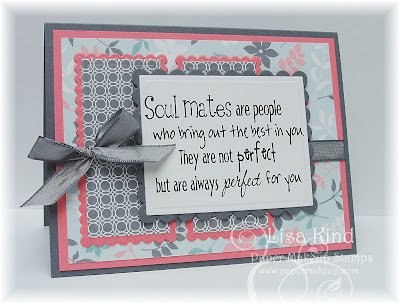 There are 12 images and 5 sentiments in this set. 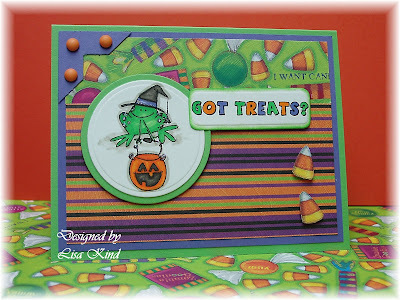 Now I have another one from Anna's second release this month called Halloween Fun. I guess it's not too early to start thinking about Halloween! All the stores have their Halloween items out already! So I decided to do something different for this one. Instead of a card, I used some chip board to create a sort of Halloween decoration. I went shopping last week with my friend, Cheryl Rowley, and we saw these chipboard albums in all different shapes with 5 pieces in a packet in the $1.00 bin at Michael's! We couldn't pass them up, and at the time I had no idea when I would use these, but I'm glad I added them to my cart! I don't usually work with this sort of medium and I don't usually do scenes, so this was out of my comfort zone at first! But I really like the end result. I used a retired SU Halloween dp called Creepy Crawly for the house. The roof is Lovely Lilac and it was run through the spiderweb cuttlebug folder. I colored and cut out the witch, cauldron, and bird VERY CAREFULLY!! The bottle the witch is holding and the hat on the bird are separate stamps that where placed there with a Stamp-a-ma-jig. I created the black fence with a Martha Stewart border punch and the overhang on the house with a scallop border punch. 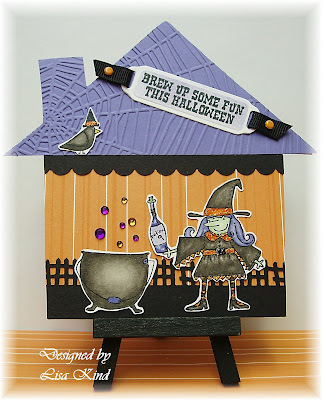 I added orange stickles to the witch and bird and purple and orange bling to mimic bubbles coming from the cauldron. 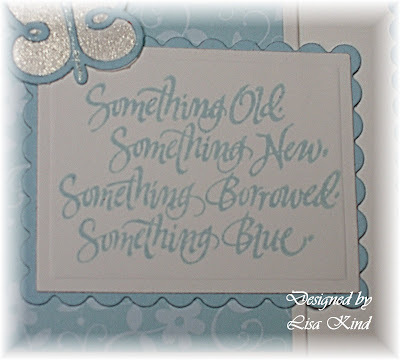 The sentiment is from the same set and I cut and embossed it with a tag die. While it was still in the die, I added some Lovely Lilac ink. I finished off the tag with black grosgrain ribbon and orange brads. I think it's a pretty cute decoration. You could display it on an easel, as I've done here, or punch a hole (there's already one on the chipboard), add some ribbon, and hang it up somewhere. 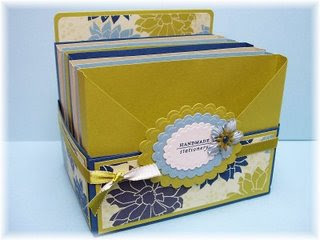 This set has 11 images and 5 sentiments. Now, if you liked these, you'll love what the other WS Feature Designers have in store. They are Heather Pulvirenti, Kim O'Rosky, Leigh O'Brien, Susan Liles, and of course Anna Wight. Stop by their blogs and leave some love. 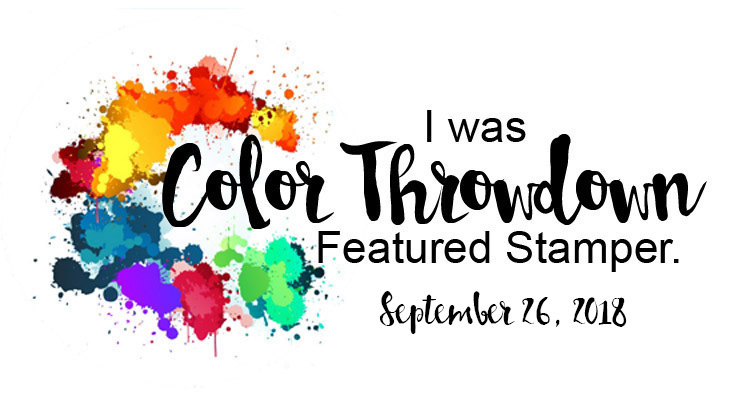 If you want to see all of the creations in one spot, go to Splitcoaststampers and search with the code WSFD. Here's the link directly to it. So what do you think of these two new releases? You'll be seeing me use them again for certain, so please make sure you stop by often this month and next month for two more new releases. Thanks for letting me share my good news with you today! Please leave me a comment and let me know what you think of these new sets! Hope to see you again soon. Hi everyone! Happy Monday! Monday is always a happy day at Paper Makeup Stamps because we have a new challenge for you! 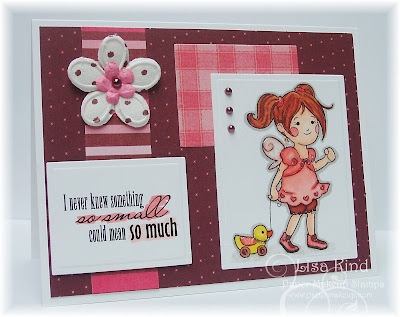 This week, Dawn Wheeler issued a great challenge...use pink and brown on your creations! I had no trouble with this as I LOVE brown with ANY color! So here's what I did. This is Shelby and she is currently available as a digi stamp from PMS. I believe Katie said she was going to be released in rubber soon, too! Isn't she just the cutest? I love the sentiment with it as well. This is also a digi wordart image found here. This wordart image is only $1.00 and Shelby is only $3.00!! Seriously, who can't afford that? Anyway, I started with my dp, as I always do and then colored my image from there. These papers are from DCWV called Garden Party. I just got this Saturday at ACMoore with a JoAnn's 50% off coupon (they take competitor's coupons)! I added Star Dust Stickles to Shelby and her toy duck, prima flowers with a Basic Grey pearl in the center, and the same pearls on the main image. I highlighted some of the words on the sentiment...love doing that! Easy peasy card, but I love it! Now if you want to play (and I know you do! ), you can link your direct post to the PMS blog. If you upload to SCS/PCP, please used the code PMSMC20 so we can find yours! Please remember to stop by the blogs of the PMS DT members (located on my sidebar) and see what eye candy they have! It's fabulous, let me tell you, cause I've seen each and every one! Thanks for stopping in today! I'll have another post today with some exciting news! Hi everyone! I went to a staggette for my dh's cousin yesterday. I brought an appetizer, but I was thinking I should bring some sort of gift. I didn't know the protocol for this type of party, but I thought I should bring something...but what exactly? I thought about it and came up with something I thought was a little clever. First, I made the card. I've had this wedding set from H & M stamps called Fairy Tale Weddings. When I saw the set, it was a must-have immediately! Here's the card I made. Isn't that image precious? I remember on my wedding day looking at myself in my mirror...I had waited a long time for that day and I just loved my dress and I felt like a princess in it! 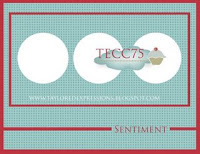 The sentiment stamp is something I've had for a long time from Rubber Stampede. When I saw the sentiment I knew immediately what my gift was going to be...I'll talk about that later. Back to the card. Here's a closeup of the bride. 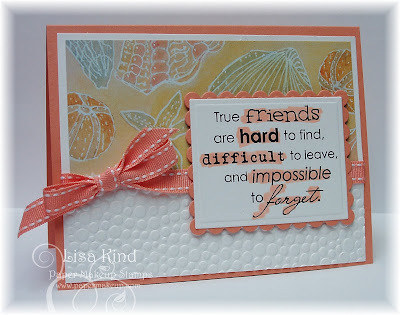 My LSS, Buffalo Stamps & Stuff, just started to issue challenges this week, and their first one was a tri-fold card. Here is the link to that challenge. I loved Sue's card and decided I needed to try this. Here is my card opened. I used Very Vanilla for my base and Fall Flowers (SU retired) dp. The blue cardstock is Soft Sky (retired). I chose the blue because of the sentiment, of course! 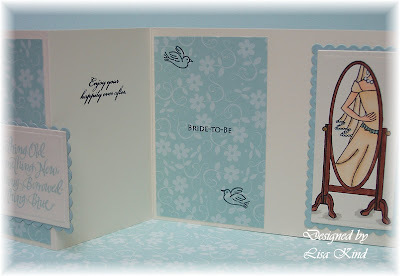 The birds and inside sentiments are from the same H&M wedding set. Here's a closeup of the front sentiment. And here's a final look at the front of the card. The butterfly is a cuttlebug die. I've added sparkle to the card with a Sakura Star Dust glitter pen. Can you tell I REALLY LOVE this card? LOL! Now on to the gift. As I said, I didn't know what, if anything, I should bring. I settled on something that literally cost me "pennies". I used one of the My Timeless Templates designed by Lauren Meader for Papertrey Ink for my gift bag called Ready, Set, Wrap. It's the cutest little thing and perfect for my gift. Here's the bag. Please keep in mind that this was the first time I used this template, so I wasn't familiar with it. If I had to do it over, I would have stamped all that white space with a vine of some sort in the Soft Sky ink. As it was, I was making this at 5:00 and had to be at the party at 7:00 and I hadn't showered or done my hair/makeup yet. Still, I think it's pretty darn cute! Now here was my gift idea. Every bride needs some luck, right? Tradition (at least in my family) has the bride place a penny in her shoe for good luck. I remember my brother giving me a special brand new penny on my wedding day for good luck! It was so sweet of him to think of that it made me cry (I'm tearing up right now, too!). So I thought if I could find a penny from the year she was born (that took some investigating), which I found was 1981, this could be her something old. I managed to find the penny, after much searching through my change jar, and cleaned it with a toothbrush and jewelry cleaner to shine it up a bit (remember I'm on a 2-hour time limit here, too!)! Here's what I did with the penny. I created the "Lucky Penny" wordart on my computer onto very vanilla cardstock and mounted it on the dp and another scalloped piece of vanilla. I placed some white packing straw on the inside to cusion the penny. This was a big hit at the party. The bride-to-be loved it! This was something that took about an hour to create and pull together. These templates are a blast to use! Have you seen the two new ones Lauren created? I don't know how she manages to top herself each month! Well, I've gone on long enough. Thanks for stopping in and I hope you enjoyed this LOOOOONG post! I just had to post all these pictures cause this was such a cute project (IMHO!!). ETA: I have another post after this one, so please keep reading! Thanks! Were you curious about what the My Time to Create DT was going to do today after seeing the sneak peek collage from yesterday's post? Well, this week's My Time to Create challenge is an inspiration challenge. This is what Lauren Meader gave us as our inspiration. I looked at this a couple of times before I decided what I was going to do. There is a lot of inspiration to take away from this...the colors, the different patterns, the layout, and the embellishments to name a few. I decided on the colors, some of the patterns, and the two red stripes going across. This is what I came up with. 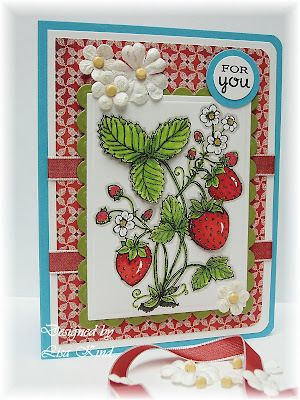 I just received this Strawberries stamp from Flourishes. It was part of their newest release. I just fell in love with this image! They have some real pretty botanical stamps...Sweet Peas and Sweet Violets are another two that I may have to purchase. They are so fun to color and they are just beautiful! As you can see, I took the colors from the inspiration piece. I have a little of the saffron color in there, but mostly the turquoise, red, and olive colors. I wanted to incorporate some of the patterns in my card and found this red pattern from Basic Grey's Marrakech dp. Lastly, I liked those red stripes, so I used SU's Riding Hood Red taffeta ribbon (retired). As I was coloring the image, I wasn't sure what color the flowers were supposed to be. I thought white, and through the miracle of computers, I searched and found a picture and found they were white with a yellow center. I took a white gel pen and colored the flowers with it to make it even more white, if that's possible! It's much more noticeable in person. If you like this, you should see the great creations the My Time to Create DT has to share with you! Stop by their blogs (most of them participated this week) and leave them some love. Why don't you try this challenge? We'd love to see what inspiration you get from this piece. If you play, link your direct post to Lauren's blog, and if you post to SCS/PCP, please use the code MTTI03 so we can find it! Thanks for stopping in today! Have a great weekend! Corrosive Challenge: Who Let the Dogs Out?!?! I found this Corrosive Challenge blog the other day and, because I love dogs, I decided I had to play. The challenge is all about dogs, so you just had to do any project using a dog theme. I decided to pull out a stamp set I HAD to have, but never used. It's My Favorite Things Friends Furever. Here's my card. I just thought this was the cutest stamp set when I first set eyes on it. I started with this great dp from DCWV called Nana's Kids. 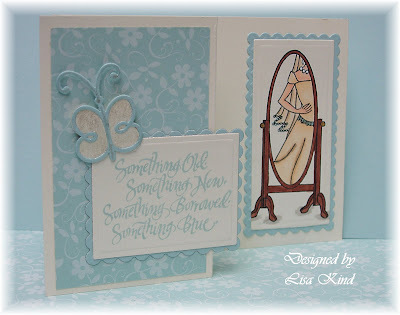 I just loved the colors in it and it paired up perfectly with one of SU's new in colors called Soft Suede. I really like this color! I also paired it with a strip of Brocade Blue that was run through the Cuttlebug with a new embossing folder from Quick Kutz (is that spelled right?) The bone tag was stamped on Certainly Celery and I placed the sentiment inside of it. The "dog brad" is actually a button that I snipped the shank off of. I've colored this cute image with copic markers and sponged some Soft Suede ink around the white parts while the image was still in the oval nestie. (Note to self: Get a softer brush to apply the ink or break down and buy an air brush system!) The tail wouldn't fit inside the oval shape, so I cut around the tail to the body and lifted that piece over the nestie while I was cutting it out. I also used Amy Rysavy's sketch for this card. Love her sketches! I hope you enjoyed this post! I just love this dog and his best friend! I miss mine...she's at our cabin this weekend with my dh and I couldn't go because I have other things going on! Have a great weekend! I'm Lisa Kind and I'm married to Kevin, the man who gave me the best last name! We have a very sweet Springer Spaniel named Martha whom we dote on! I'm a retried 5th grade teacher and love to craft, read, and travel. Click to see my featured card. 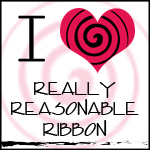 Check out my honorable mention card here! This card was a top 2 winner! See my Top 3 card here! Click to see my featured card! 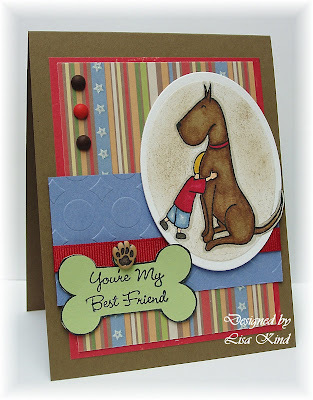 All content (including text, photographs, and designs) are copyright by Lisa Kind. My artwork is shared for personal inspiration only and may not be copied for publication or contest entry. PMS Monday Challenge - Button Up! Another PMS Release Party Challenge! PMS Release Party Sketch Challenge! PMS Blog Hop and Release Day! PMS Sneak Peek Day 2!